You deserve to have a beautiful smile that looks stunning and functions healthy. Dr. Shivani Maharaja and her experienced team are the premier cosmetic dentist serving Fairfax, Tysons Corner and Merrifield. We are dedicated to providing a wide range of services to best suit each patient’s needs. We offer solutions addressing a variety of dental and health issues. Our office provides routine cleanings and exams along with along with other general, restorative, and cosmetic procedures. Aside from her daily restorative procedures, her specialties include Chao’s Pinhole Gum Rejuvenation, Veneers, and Invisalign. Dr. Maharaja is recognized as a preferred provider for Invisalign. 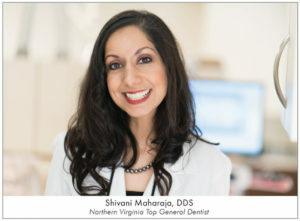 The quality of Dr. Maharaja’s work along with the explempory customer service of her office have earned her recognition amongst peers as a ‘top general dentist’ in Northern Virginia. Let us welcome you into our dental family. Contact our office to schedule a complimentary consultation with Dr. Maharaja.